Defects play an important role in determining the properties of solids. 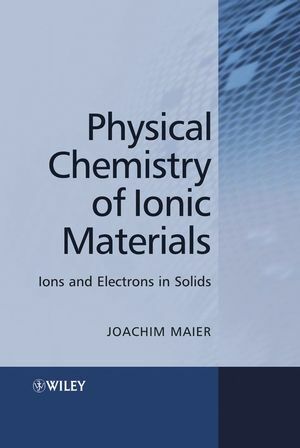 This book provides an introduction to chemical bond, phonons, and thermodynamics; treatment of point defect formation and reaction, equilibria, mechanisms, and kinetics; kinetics chapters on solid state processes; and electrochemical techniques and applications. * Offers a coherent description of fundamental defect chemistry and the most common applications. * Up-to-date trends and developments within this field. * Combines electrochemical concepts with aspects of semiconductor physics. Joachim Maier is Director at the Max Planck Institute for Solid State Research in Stuttgart and heads the department of Physical Chemistry. Maier studied chemistry in Saarbrücken, made his Masters and PhD in Physical Chemistry there. He received his professorial degree at the University of Tübingen. The defect concept: Point defects as the main actors. 2. Bonding aspects: From atoms to solid state. Chemical bonding in simple molecules. Many atoms in contact: The solid state as a giant molecule. 4. Equilibrium thermodynamics of the perfect solid. The formalism of equilibrium thermodynamics. 5. Equilibrium thermodynamics of the real solid. Equilibrium thermodynamics of point defect formation. Equilibrium thermodynamics of electronic defects. Boundary layers and size effects. 6. Kinetics and irreversible thermodynamics. Diffusion kinetics of stoichiometry change. 7. Solid state electrochemistry: Measurement techniques and applications. Preliminary remarks: Current and voltage in the light of defect chemistry.